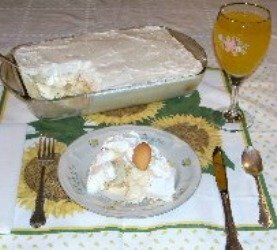 Old Fashioned Banana Pudding is a Banana Pudding recipe made from scratch with evaporated milk and sour cream. Topped with whipped cream it makes an easy, luscious dessert with awesome, unique flavor. This method renders fresher banana taste because it isn't cooked in the oven to brown as is meringue topped puddings. Pour water into a large saucepan. Stir in flour until smooth. Add sugar and mix well. Add eggs, one at a time, mixing well after each addition. Slowly stir in milk, mixing well and place saucepan on low heat. Cook, stirring constantly (to prevent sticking), until mixture is thickened to the consistency of a thick gravy. Takes approximately 20 minutes. The mixture will start steaming and produce a few bubbles, which indicates it is about thick enough. Remove from heat. Stir in vanilla. Cool thoroughly. Fold in sour cream and mix well. Place a layer of vanilla wafers in the bottom of an 8 inch by 11 inch oblong or 2 quart baking dish**. Top each wafer with a 1/4 inch slice of banana. Pour a layer of pudding onto wafers and bananas. Repeat layers again until pudding is used up. Spread whipped cream on top. Refrigerate for several hours or overnight. This allows the pudding time to set up properly and the flavors to permeate. * The original Old Fashioned Banana Pudding recipe called for 36 vanilla wafers. However, many wafers have been reduced in size recently, causing you to need more. I needed 48 a few weeks ago, when I made this recipe! Use equal amounts of banana slices, wafers, and pudding mixture as you layer your pudding and you it will come out perfect every time! ** For an attractive and special presentation, layer pudding in a trifle bowl instead of an oblong pan. For an extra smooth pudding, use a whisk to stir and mix as you blend the ingredients together. To help bananas from ripening too soon and turn brown, remove them from plastic or paper bags immediately. Place them on the tabletop or in a bowl out of direct light. Do not store bananas in the refrigerator. It is too cold, around 38F. Bananas are kept at 58F., much higher than your home cooler, during shipping to prevent ripening. To prevent the slices from turning brown, dip them in lemon or lime juice. For less citrus taste, place the slices in a mixture of 1/2 cup cool water and 2 tablespoons lemon or lime juice for 3 minutes.